This type of deck has been play-tested by DeathsAdvocate in his thread, thought I’d post my own version in Duelspot since there isn’t any in here. Special thanks to DA! You have Rebuke against Wanderer, and Plasma storm for swarm decks. By now you should have answered all their threats with Rebuke, P-Storm, Lavaslasher, Makantor. OR, you’ve dealt a lot of face damage to them as they couldn’t answer your scary turn1 openings. You’re not gonna out-heal a Zir’An with your limited amount of healing in the deck. Fault gets you eventually. Wanderer decks can body block with their buffed up minions. The only win-condition this late in the game is Flash-Decimus Double Tectonic Spikes for 18 damage at 8 mana. Always try not to go for long games. Decimus over Spelljammer, because you need another win-con. 2 Rebukes : 1 P-Storm split is really up to you, in my climb to S-rank I faced a lot of Wanderers so…. I sometimes even cut the P-Storm and replace it with another rebuke. Only 2 Lava Lance – We aren’t running Cryptographers and Spelljammers, and we usually use GF to get better trades, so if you play alot of these 1 mana cards, you’re gonna be forced to play Spikes as card draw and not as a combo piece. Only 1 Eggmorph – Because we don’t really have space for a second one, sorry. I can maybe replace one Entropic Gaze for an extra Eggmorph, though I think I probably won’t do that. Many times, I drew an Entropic Gaze after doing DeciSpikes to get that little bit of damage for lethal. No Bloodtear Alchemists? – Yes, I know this is a really good card and fits more in this deck that looks more of a hybrid aggro-midrange list, but ultimately I cut it out for Entropic Gazes which worked really well. 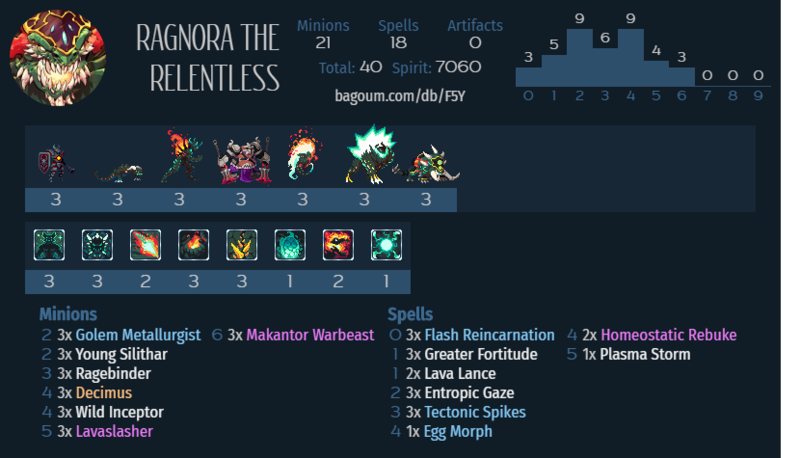 Arcanyst decks – Yes, we aren’t running dispel, the only clean removal you can do is Eggmorph on their Owlbeast. Or hope they only buff up their Owlbeast Sage once, allowing you to clear it with Lavaslasher + hit with your face. Most of the time you are gonna be looking to ignore their scary board and just push face damage so you can hopefully win with one of your combos. Aggro Cassyva – Between Spectral Blade, Void Pulse and Desolators, this sassy general has a lot of ways to heal up, while burning your life. Dark Seed is a threat especially after we use Deci-Spikes, Ripper combo isn’t gonna do you good with Spectral Blade up, and you can’t preemptively play Ripper egg in a safe spot as well if Cass has her BBS. What’s worse, she can cleanly clear our Lavaslashers and Makantors with Punish.